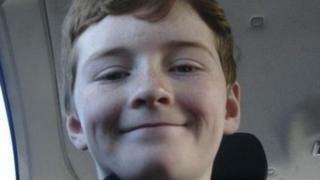 A utility company has been fined £2m after a boy died when he slipped from an exposed gas pipe and fell into a canal. Robbie Williamson, 11, from Burnley, Lancashire, died playing a game of dare with friends in April 2014. He was using the pipe to cross the Leeds and Liverpool Canal in the town. National Grid Gas PLC was ordered to pay the seven-figure sum after admitting health and safety failings at Preston Crown Court earlier this year. Robbie and his two friends had been crossing the pipeline running on the outside of Dugdale Bridge at Lowerhouse Lane. They were able to climb onto the pipe from a ramped footpath because there had been no access prevention measures fitted. Prosecutors for the Health and Safety Executive said the company had failed to properly protect the exposed pipeline from the risk of injury from falls. The gas distributor was also ordered to pay £36,102 in costs. The court heard National Grid Gas PLC employ a procedure for inspecting above ground pipe crossing with requirements for providing measures to prevent access. But records had incorrectly shown that the pipe was buried within the bridge, meaning the crossing had not been subject to any inspections. Despite maintenance work being carried out in the past, records had not been updated. Robbie was taken to Royal Blackburn Hospital but died later that day. A post-mortem examination found he died from drowning and a head injury. A verdict of accidental death was recorded at the inquest. Steel "fans" were later fitted to the pipe crossing after a HSE improvement notice was issued. After the sentencing, a spokesman for National Grid, said: "We're deeply sorry for what happened to Robbie Williamson. "He and his friends were able to climb through railings owned by the local authority and onto the gas pipe because there weren't adequate measures in place to stop them. "We put guards in place on the gas pipe shortly after the accident and also on other similar crossings throughout our network too. "We contacted other utility companies to make sure they were aware of what had happened so that they could take action as well."